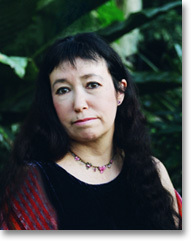 Pascale Petit has published four poetry collections including The Huntress and The Zoo Father, which were both shortlisted for the T.S. Eliot Prize and were both books of the year in The Times Literary Supplement. Her latest collection is The Treekeeper�s Tale (2008) and forthcoming in May 2010, What the Water Gave Me � Poems after Frida Kahlo, all from Seren. The Poetry Book Society and Arts Council named her as one of the Next Generation Poets in 2004. A bilingual edition of The Zoo Father is published in Mexico and her poems are translated into many languages. In 2008 she took part in the Yellow Mountain Poetry Festival in China and the British Council�s New Silk Road project in Kazakhstan. She originally trained as a sculptor at the Royal College of Art and has worked as editor of Poetry London. She is the Royal Literary Fund Fellow at Middlesex University and tutors for Oxford University, The Poetry School and Tate Modern.